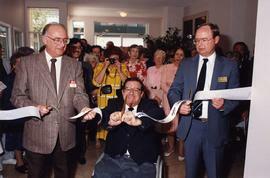 Photograph depicts (left to right) Ted Goodson, Doug Mowatt (B.C. M.L.A. ), and Canada Mortgage and Housing Corporation representative Michael Young at the ribbon cutting ceremony for the newly constructed B'nai B'rith Manor. Al Jackson - installed as 1st Vice Pres. 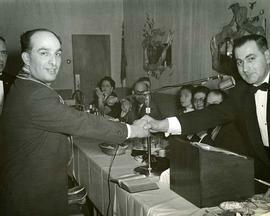 Photograph depicts Alec Jackson (left) shaking hands with an unknown member at a B'nai B'rith installation ceremony. Photograph depicts the 1971 B'nai B'rith Lions Gate Lodge Executive Board. Members include Ralph Brie (front, right) and Alec Jackson (front, third from right).